Mercedes-Benz had created a new concept car - the AMG Vision Gran Turismo. 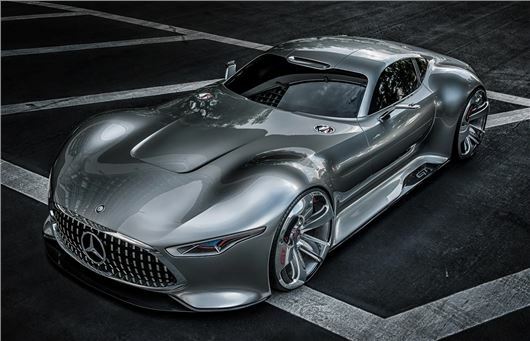 The car is available virtually in Gran Turismo 6 due out in December on the Playstation3, but Mercedes-Benz has actually built a full size version. The car will be on display at the Los Angeles motor show taking place this week. The concept has some classic Mercedes-Benz design features like a big gaping grille reminiscent of the 1950s 300 SL racing car. There's the classic long bonnet, a swooping rear and of course classic gull wing doors. Inside the AMG Vision Gran Turismo has an F1-inspired cockpit with red integral sports seats while the instrument cluster is a glass surface floating above the racing steering wheel. It's powered by a V8 biturbo engine developing 585PS with maximum torque of 800Nm and thanks to an aluminium space frame body and carbon fibre components, it weighs just 1385kgm. It gets AMG ceramic high-performance composite brakes plus an AMG sports exhaust with eight tailpipes integrated into the rear. You can see more of the Mercedes-Benz the AMG Vision Gran Turismo in our gallery here.